921B LAVAL CRESCENT, KAMLOOPS, B.C. Forget ordering in or investing in an expensive pizza oven. You can make wonderful pies that approach the results of a brick oven on the barbecue grill you already own! A pizza stone (or its steel alternative) is a must when it comes to grilling pizza. Start by preheating it inside the grill for about 30 minutes. With either the stone or steel cooking surface, you will need a paddle-like tool called a peel to transfer the pizza in and out of the grill. If you don’t have a pizza stone, a thin metal round or rectangular baking pan, or a heavy cast iron pan (for deep dish pizza) will do. To prevent sticking, be sure to brush olive oil on the pan before placing the dough and toppings inside. Proper temperature and heat distribution is key to achieving a perfectly baked pizza pie with a fully baked crust and completely cooked toppings. Too much heat coming from below the pizza could burn the crust and leave the toppings undercooked, while too much heat in the top of the barbecue chamber could cook the toppings but leave the crust soggy. Experimentation will likely be necessary before you identify the best pizza grilling temperature for your particular grill. To avoid doughy crust, many recipes recommend grilling one side of the dough, flipping it, and then adding toppings. But this isn’t necessary. You can achieve great results by placing a fully assembled pizza on the grill as long as you pay attention to the temperature. A good thermometer, especially an infrared one, will allow you to spot problems and make adjustments to fuel and ventilation. The height of the barbecue dome, airflow and food moisture all affect the thermodynamics. Use your thermometer to measure the air temperature inside the grill and the stone or cooking pan. A pizza stone at 260 to 315 C is a good range, and you’ll want the air temperature inside the grill to be about 180 to 205 C.
Here are a few pizza recipes for you to try. If you’re feeling experimental go ahead and change up the toppings to make the pizzas your own! This recipe explains how to make a homemade crust. Add pizza sauce and mozzarella and start grilling. With diced chicken breast, artichokes, mushrooms, spinach, and garlic white sauce, this pizza provides a great alternative to tomato sauce pizzas. Instructions include an easy way to make white sauce from scratch. Once you’ve gained confidence in managing the heat inside your grilling chamber, you can prepare this luscious sausage pizza. Make sure to keep the heat high so that the meat cooks all the way through. This recipe uses unexpected ingredients like honey, Italian dressing, curry paste and coconut milk to create a delicious change of pizza pace. 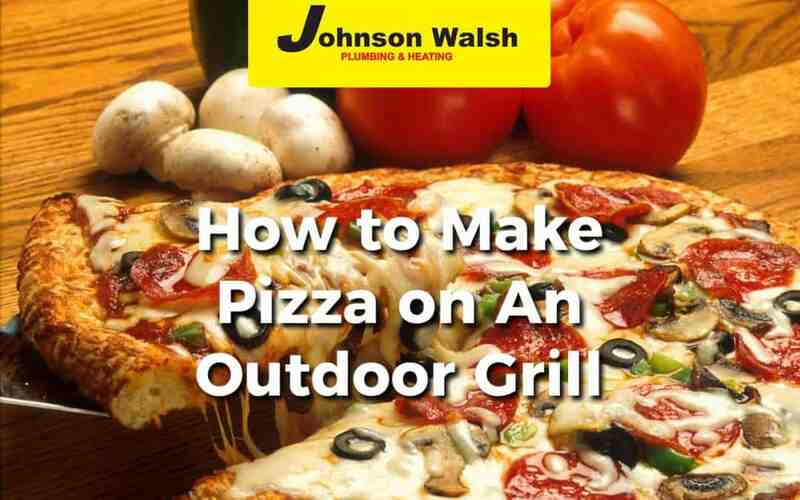 Johnson Walsh Plumbing & Heating in Kamloops carries a variety of barbecue grills, including the renowned Saber Grills, that you can use for making pizza—as well as many other delicious items. Visit our showroom and we’ll give you a closer look! Contact us today to learn how we can assist you with replacing the required parts in relation to this recall.